​What home renovation ​info are you looking for? On This Page: ​Read about home remodel financing options​. ​You'll still have your daily routine ​during your home remodeling project. ​Read on to see the things to consider to help you decide whether you should stay​ in your home during your project - or whether to relocate temporarily. ​A Basic Remodeling Decision - Temporary Housing ​During Construction? ​Whether you decide to update the kitchen, add a room to the house or do a full home renovation, choosing whether or not to live in ​your home during the remodeling project is an important decision. ​Among other things, the size of the remodeling project will help you determine the right course of action to take under such circumstances. 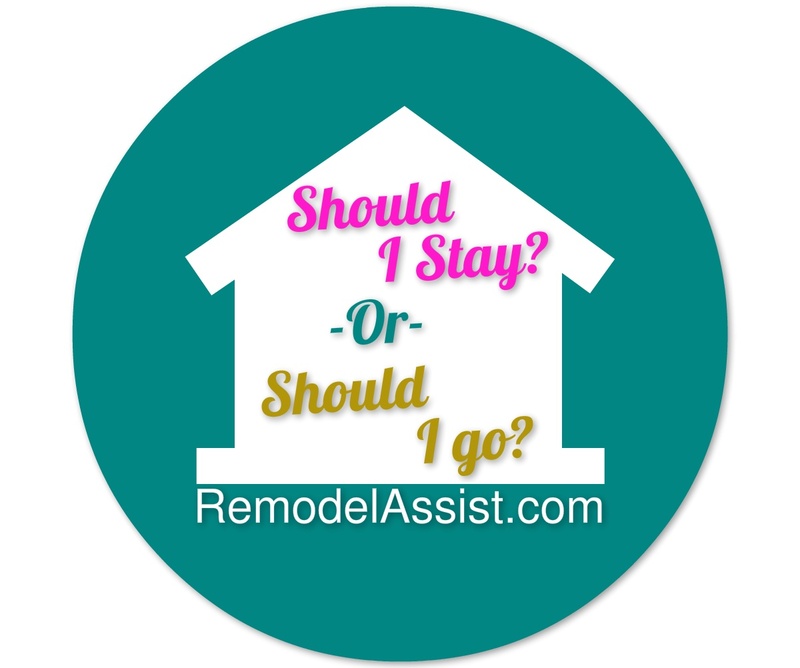 But, there are other factors to consider when deciding whether to stay in your home during your home ​remodeling project - or to seek temporary housing during construction. ​You may not be surprised to realize that there are advantages​, as well as disadvantages in choosing either option. Many homeowners initially think that they should stay in the house during a remodel. They assume that they can stay on top of the designers and contractors when they stay at home. But, there are so many factors to consider before making such a decision. In fact, remodeling a home interferes with everyday patterns that you hope to maintain in your home. Your peace of mind is going to be affected as a result of staying in the house when renovations are carried out. The following are some things to consider when choosing living accommodations during a home remodeling project. ​The first thing to look at is the extent of the remodeling project. For example, if you plan to add another room to your home, you may not need to leave the house. But if you plan to do a full renovation, you might not be able to put up with the mess, noise, or inconvenience created during the process. That is when you typically would look for another place to stay during your home renovation​. If the renovation work includes more than half of your house and affects the bathroom and kitchen of the house, it is likely worth moving temporarily. Also, if the job takes a month or more, you should consider renting a home, apartment, or extended housing nearby so that you can keep an eye on the work going on. ​Airbnb - Similar to ​noticing a rental home in your area, Airbnb has makes it easy to find available living quarters around you. ​Corporate Housing - You can search the membership directory on the ​Corporate Housing Providers Association website to find a corporate housing provider in your area. Another option is CorporateHousing.com. Short-term Stay Establishments - There are several companies offer extended stay living, including Extended Stay America, Candlewood Suites, Staybridge Suites​, and Courtyard by Marriott. Most come with kitchens, flat-screen TVs, wi-fi, and an in-suite laundry set-up. You may be able to get discount pricing for longer stays. And, you may also get free light breakfasts in the deal. ​An RV - While it may almost sound like a silly suggestion, if you have a recreational vehicle, ​living in it during the remodel may make sense to you. If your lot is big enough to accommodate an RV ​AND all of the construction materials, you may be able to camp on-site (a neighbor of ours is doing this right now). Coordinate with your general contractor about possible placement & access, and check with your homeowners association first - if you have one. Otherwise, you can park your RV or arrange for temporary housing RV rental in an RV campground in your area. ​Of course, home improvement projects like minor roof repairs don't require the homeowners to move out. Yet, if your safety is at risk, the contractor may request you to stay away while the work is being completed. Hence, the extent of the project is what should decide whether you move out or stay in during the renovation process. Even if it is a smaller project, you may have to put up with quite a mess most of the time. Just imagine the noises generated during the demolition process, from the new construction, and random coming and going of workers! Also, some contractors or their construction crews typically listen to music that's almost always playing too loud. It's also not uncommon for construction crew members to use inappropriate language while working. Ask yourself if you can you put up with such noises and behavior - especially if you have kids. When moving into temporary housing​, I recommend that ​you take time to completely photo-document the conditions of the property you'll be moving into (interior & exterior) before you move in. ​At minimum, take a picture of a room from each corner of the room. Take photos of any damaged areas - including ​cracks, scratches, or holes in walls, tiles, glass, countertops, ovens/stove-tops & sinks, etc. What does the yard, driveway, garage floor, & walkways look like? Photograph oil & rust spots on the driveway​ - one close-up & one at a distance for each spot. In the age of digital photos, it's easy to take lots of pictures. It just takes a bit of time. These photos can easily prove pre-exisiting damage conditions should the landlord choose to want to not return some or all of the cleaning deposit. ​If ​your kitchen or bathroom is being updated, it is may be a stretch to consider remaining in the house. If you have two or more bathrooms with a tub or shower, you may be just fine. If just one, don't even consider staying in your home. If your kitchen is being gutted by a kitchen remodeling contractor, how will you cook, store food, or clean dishes? While the following wouldn't necessarily work for every family, as a teenage, my Dad & I gutted our early 1960s kitchen to create a brand new, modern kitchen for my Mom. By the time we finished demolition, our kitchen was nothing more than a ​completely empty room. Microwave ovens were so new back then, nobody in our neighborhood had one - and we didn't get one until we completed the new kitchen. And, we didn't have one of the modern large toaster/convection ovens that are available everywhere nowadays. During demolition & construction, we survived off of a hot plate on a bathroom counter, washed dishes in the laundry sink in the garage, and used the garage fridge. While toughing it out "worked" back then, we did indeed relocate to temporary housing during construction on our most recent full home remodel. And, that worked out much better. ​When taking a kitchen or bathroom out of service, the best option may well be to move out temporarily ​until the kitchen or bathroom is back in service. Also, if your contractor will need to take your electrical power system offline or take out sewer drain line for a period of time, you'll need to find another place to stay. And, whether you stay or relocate temporarily, you should always ensure the home improvement contractor provides a portable toilet for his crew. Trust me when I say this (from experience), you do not want construction workers using your facilities. ​There are a number of advantages of leaving your home during the renovation process. The most important thing is peace of mind and a pleasant living experience. But, there are other things to consider when finding temporary accommodation during the construction process. ​Is it feasible for you to also pay for short term rental during renovation​? Should it be a house, apartment, or an extended stay set-up? If you can afford it, what​'s the maximum distance away it should it be? Do they allow pets? ​​If you can afford it relocating temporarily, what​'s the maximum distance away it should it be from your property? From work? From other things you do in your daily life, like taking kids to school, sports practices, your favorite grocery stores, the gym, etc.? Will you need to allow more time getting to work, schools, etc.? ​Does your temporary housing provider allow pets? If so, any limitations? Do you have an unusual pet, like a potbelly pig? Will the ​provider allow a pig? What if you have two or more dogs or cats? How about birds that can make a lot of noise, like a ​Macaw? Discover the things to think about when deciding whether or not to find temporary housing during ​your #home #remodeling project. There are important things to consider before deciding to leave your home during a home remodeling project. ​Should you choose to find temporary housing, be sure to look into it well-before needing it. It may well take more time ​that you're expecting to get everything arranged. In ​our case, we needed to commit to renting the house we wanted to move into a month earlier than we actually needed it. But, it was a nice clean home located very close to our construction site - affording us the ability to see the property multiple times a day. And, it ended up giving us more time to move in​ at a relaxed pace. Finding a suitable temporary rental home, apartment, or extended stay housing is made easier using the Internet. ​Your thorough research is very important in this regard. You should be checking local newspapers, real estate websites, and yard signs for rentals nearby. That is the best way to find an appropriate accommodation during a home remodeling project.